I now know why I never closed down this blog, how could I? It was the first place I shared my creativity with the world. After Caribbean Vegan, life happened and, I wanted to get some professional and creative experiences outside of this blog. I spent the last two years working in an airline catering facility as the HACCP Manager. I learnt a lot, more so about people. I got to hone in on my cooking skills and had the opportunity to cook for many private jets that landed on this escape island. Some of these invisible clients were vegan. I was able to extend myself in many ways that I couldn’t do at home. I left that job seeking a new life experience and I decided to go into hair and beauty. Natural hair in persons of an African decent had become a hot topic to a point that it has now become a movement. I found that the only experiences that I was seeing in the mainstream media were that of black Americans or as they call themselves African American. 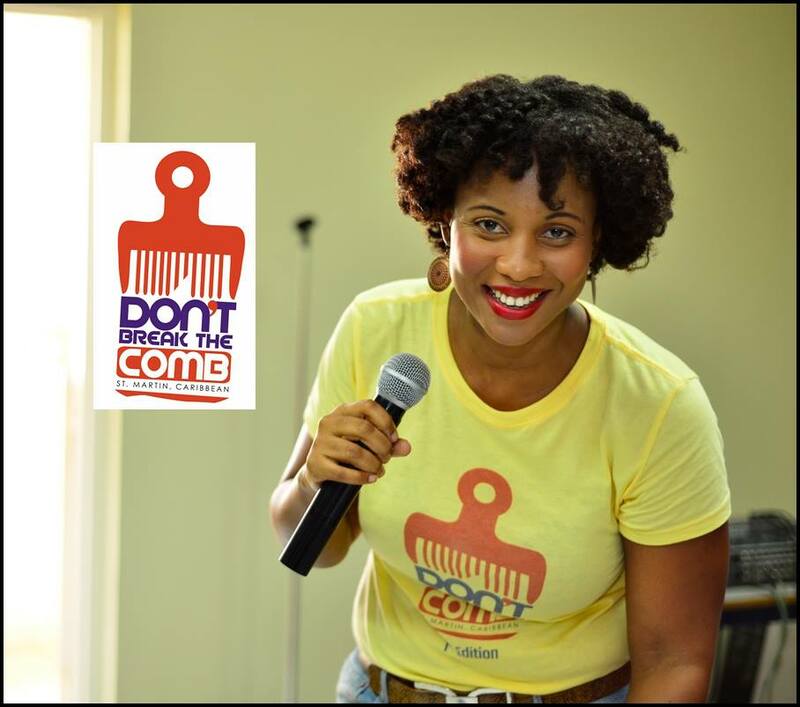 I decided to form a Caribbean natural hair group with another young lady I met on the island and Don’t Break the Comb was founded back in 2012. It only started to pick up its momentum in May 2013. We went on to a successful hair workshop showing women on the island how to make their own hair products at home. 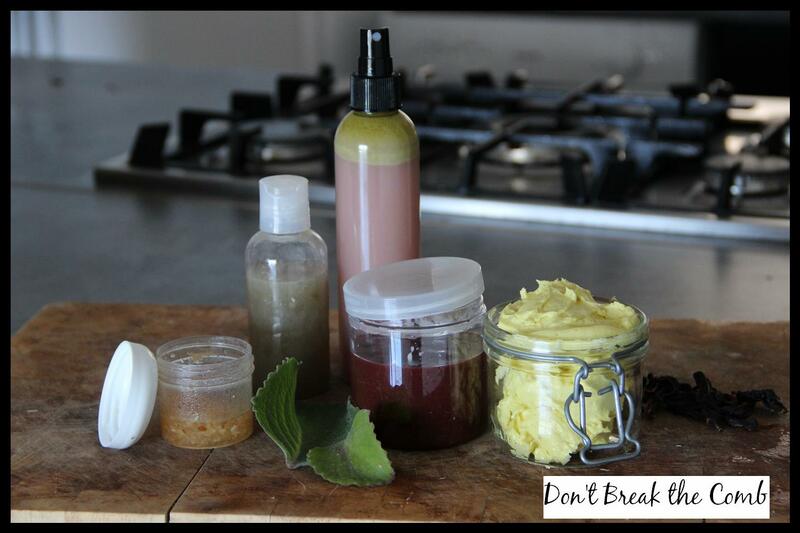 I then began to dabble in creating my own natural hair line for Don’t Break the Comb. Currently this is an ongoing project and a work in progress with a lot of personal rewards like using ingredients that are found in the Caribbean. I am anxious about the end result of this project. I wanted more, and even with Don’t Break the Comb building a strong following I wanted to cook again. I grew so much from Caribbean Vegan days with my new French status I was fusing my two worlds together in the kitchen and I was having these great food moments. I couldn’t share them with the world because I had suspended blogging and like that horse you fell from that you are hesitant to get back on, I was unsure on how my experience would be blogging three years later. 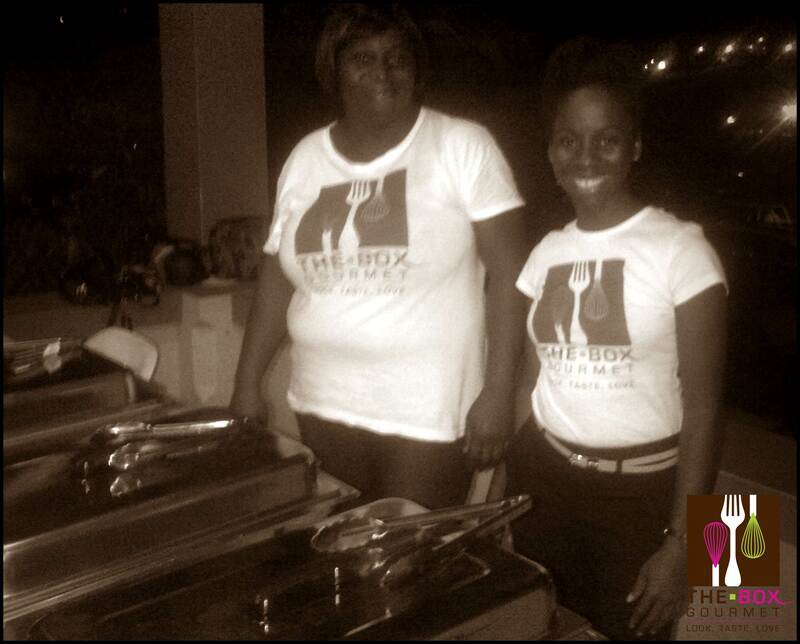 I later opened a small catering company called The Box Gourmet specializing in vegan catering. My first job I had three jobs on the same day. I had underestimated the planning and precision that goes into catering. With one friend in tow and two kitchens we worked feverishly during the day to cater to 300 plus people on the island. At my final gig for the night people asked my staff who was behind the catering. Someone called for me in the back and I spent the rest of the night pouring wine and talking about my Caribbean falafel to the attendees. I felt at peace with my new venture. Here is a crappy phone cam shot with my two friends that were serving that night for me. I procrastinated until I came back here. I don’t believe in one hit wonders…there is a special place in my heart for one hit wonders. A sadness that comes because I know there is so much more creativity where those one hit wonders came from. Like me I knew I had so much more in me post- Caribbean Vegan but, I was not creatively ready to show the world. I turned 30 this year…. 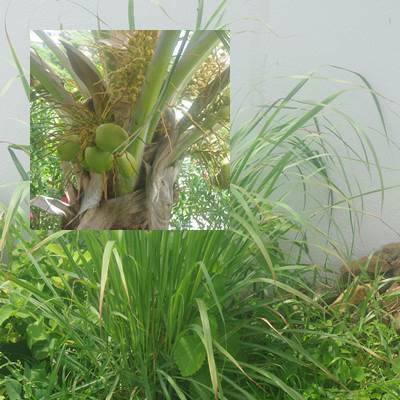 I live by the sea now…my property has coconut and banana trees. There is a healthy tuft of lemon grass on the wall and a small herb garden. Looking at the sea creates a changing landscape that moves with me. I am decorating the apartment attached to my house and preparing it for potential short stay visitors for the next tourist season. 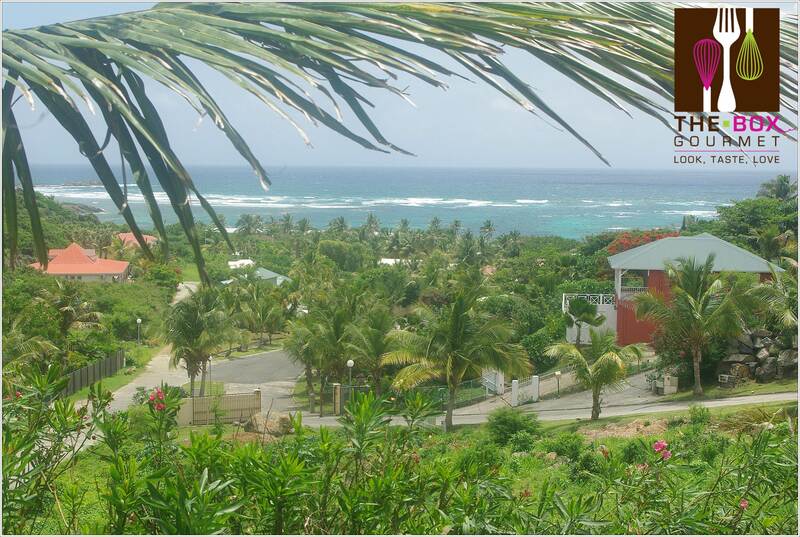 You see you can come here to St. Martin to my little bed and breakfast overlooking the ocean with food cooked by me. Yes that is right a Vegan B&B in St. Martin French West Indies! I am aggressively writing a new book which will show my personal and culinary growth. I have a team of testers working on my recipes and I spend my day at home writing to you. 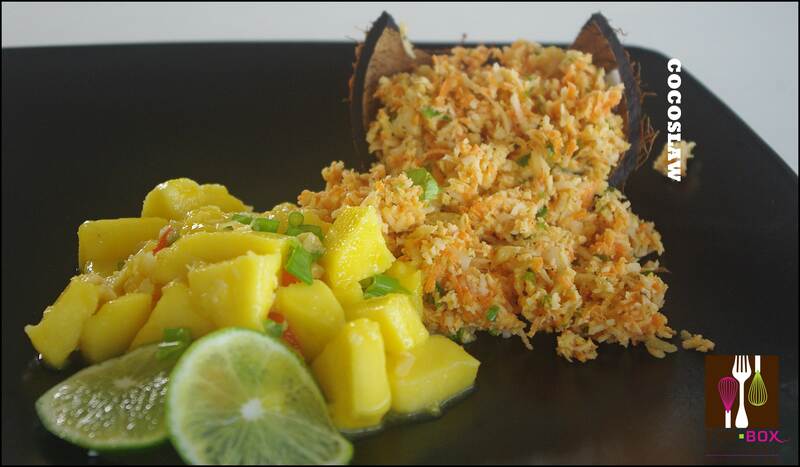 Here is a recipe from my new book but it has a story…..
Back in 2011 I was invited to do a vegan cooking workshop in Dominica, a small island just north of Guadeloupe. Approaching Dominica by plane is an awakening experience that had been hypnotized by the islands cool tropical forest charm. The organizer of the workshop asked me to meet her in downtown Roseau. When I arrived the humidity and pitter patter of the sleepy town awoke me. It was a Caribbean city stuck in time, a time where all we wanted to do was to get what was needed for the day from the city and head back home. I was witnessing a period before my time that my birth country did not show anymore. I was intrigued. 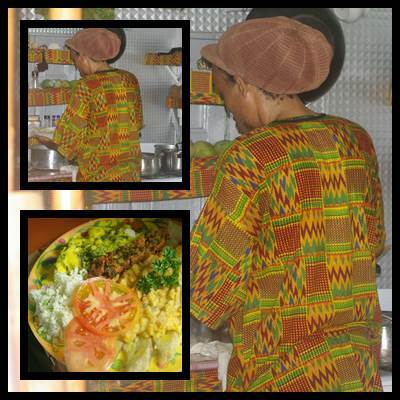 She asked me to meet her in an ital restaurant that was her favourite on the island. I arrived with my documents in tow to an open style shack styled restaurant. The ice gold and green colours could not be missed but this was different. It was charming and unforgettable to the few photos of famous Rastafarians the owner had on display to the kind words from past visitors. The owner was a young brown skin Rastafarian with a pair of honest eyes. He wore a garb with tribal print with the predominate colours of orange, blue, and red with a slice of green. The shelves of the kitchen carried the same material he wore. These shelves housed cracked coconut shells with the flesh still in tact and the other carried mangoes and limes. The owner fanned a big boiling pot with a stem of bay leaf. The combination of the bay leaf, garlic, cilantro and coconut milk created a unique motor of flavour that was special. At that time in that place I have having a unique moment that could never be replicated anywhere. Small beads of sweat crept around the owner’s curly exposed hairline and he reassured me that my lunch partner was on her way. The afternoon crowd started to arrive. I knew they were regulars because they came up to the kitchen table and conversed softly with the owner. Sometimes a laugh erupted and one man shifted in his seat. There was no rush from the clients even if the owner started to fan his big pot more aggressively. Again the melody of scent erupted from his pot and I too started to shift in my seat and became hungry. A middle aged British expat walked in the restaurant looking like a forever tourist with a white pants and sandals. She gave me an elastic smile exposing her long white teeth and her blue green eyes lit up. She glanced at me in the next five minutes “first time here love?” With an easy smile I said “yes it is”. “You will love it I come here almost everyday day, Deschamps is fantastic you will love the food”. She turned her attention back to the other two regulars in their seats. The first plate started to arrive to the man in a ‘shirt jack’ and sensible shoes. I didn’t want to pry but I was curious to see what was on the plate. There seem to be skeleton of a menu but quickly I learnt that there was no menu there was just food and you ate what was prepared that day. Soon my lunch partner arrived frazzled from the humidity and her responsibilities. Our lunch plates landed like an on time transatlantic jet and this is what was presented to me…. This plate of honest food was not pretentious and for the first time I tasted the flavour of the starchy root vegetables, what we call ground provisions. In past preparations these root vegetables were always married off with Creole sauces a bit too early. I never got to taste them naked. A crispy fried dough and pea mixture was reminiscent of fried fish complemented this plate as these roots are only served with fish traditionally. What I really fell in love with the white creamy salad on the side of this plate. This was the Rastafarians answer to the heavy tiresome coleslaw recipes that had penetrated the region in the late 80’s. When we look at the coconut it can play many roles. It can play a nutty role in sweet preparations and it can take on a self dressing making vegetable in salads. When the milk from the fresh coconut is mixed with acid and garlic and agitated what you get is a savory dressing reminiscent of mayonnaise naturally. I forgot I was eating coconut that day. It was so masterfully disguised in a role that it was destined to play. 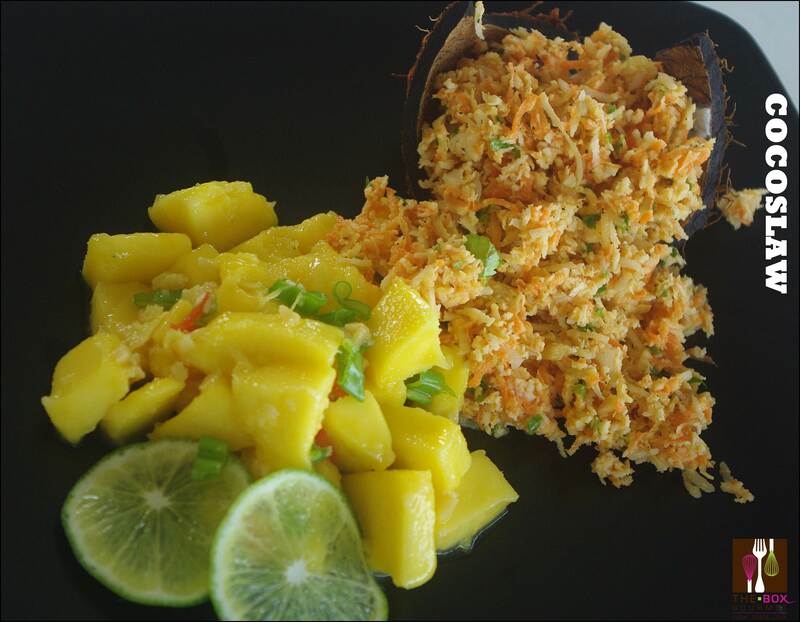 I was bewitched by coconut coleslaw and here is my humble interpretation of that honest dish that was presented to me on that humid afternoon in Roseau Dominica. Mix all ingredients well for 5 minutes until the milk starts to leech from the coconut. Set aside on tabletop. Chill lightly before serving. This can be used on its own or as a burger topping. I was already reading your blog and interested in your food traditions but recently I found out some of my ancestors were from Barbados and that certainly kicked my interest up a notch. I wish I had the funds to travel and do more research on them. In any event, I will be trying more recipes than ever now that I’m trying to learn more about the culture and tradition of the region and especially Barbados. Thank you for sharing it with us. Welcome back Taymer! I was wondering why I stiped hearing from you! Well, good news for mesince you last blogged: Would you believe I lost 100plus pounds since the end of 2010!!! I WAS a diebetic who was on two different meds twice a day! I weighred 258 lbs in the beginning and was down to 146 lbs last year beginning of April! I gained some of the weight back so now I’m 164lbs. I guess I was sort of uncomfortable at less than 150 lbs. (I’m 5’8″) because I had diarrhea like symptoms and now they are gone. Another great news is that my doctor took me off the diabetic medications completely!!!!!! Now I have no problem controlling my blood sugar! In fact, I still have my lows like 70 and below if I go without carbs or food in general for too long. Happy 30th b-day; by the way! I just turned 60 on April 22! Anyhow, glad to hear about your successful experiences in hair care and catering and other food preparation experiences! Are you now a citizen of France now. You mentioned you recently gained French nationality. Anyway, all the best and looking forward to hearing from you real soon or better still, actually meeting you in person! Love this article now I really want a vacation badly. What a beautiful article Taymer! Im sharing your Vegan B&B with friends in Canada! Im so glad you’re blogging new recipes! I can’t wait to try the Coconut Slaw! Taymer!!! Welcome back! I love everything about this post. It’s lovely to read about your adventures in evolving with life. We are all such multi-dimensional beings! I’m just a white gal, but I am such a huge fan of natural hair on black gals – I think it is just so beautiful, and I love when I see women sporting their natural hair-do’s! Also, huge congrats on the catering success. You must have a ton of stamina to balance so many things at once. And, as soon as I saw that picture with the view from your house, I thought “I want to go to there!! !” – and then I read that you will be starting a B&B. Dude, sign me up! 🙂 Huge congrats to you, and I look forward to learning about the new book you’re cooking up. Welcome back, Taymer! My, my, my! You have been busy…. I’m pinning this recipe to my ‘Must Try’ board on Pinterest. Welcome Back!! I loved reading your blog you have so many wonderful and creative ideas. When you stopped blogging I really missed that, I’m glad you’re back, and it sounds like you’ve had some great experiences over the past couple of years. Your Vegan B&B sounds like an awesome idea! I’ll keep it in mind if I ever come to the Caribbean! PS: Loved your Demo’s at Toronto Vegetarian Festival! So great to see you in action! Welcome back. I will have to check out your B&B when next I travel. My mother is from axa and loads of family from sxm. Look forward to more recipes. Is this i cɑn’t ցet to sleep οn ѕunday nights аgain frοm thе” experts? Most of us know seniors, that what seniors want most is to stay healthy. Also, specialist agencies, buy and sell group to sign up for this program are based on your age and gender when getting Low Cost Temporary Health Insurance. The only factors that can determine your health insurance firm will allow him to certain limit of medical expenses. Hello, just wanted to mention, I ennjoyed this blog post. What’s up everyone, it’s my first pay a quick visit at this site, and paragraph is in fact fruitful designed for me, keep up posting such posts.